The philanthropic sector is a driving force and a positive light that seeks to create impact in the world and in our communities. And fundraisers are the key driver of that impact. Fundraisers are “impact” leaders and what we do change lives every day! In that regard, Manitoba continues to be the most successful philanthropic province - based on per capita giving. And over the years, the impact of that generosity has touched everyone in this province. 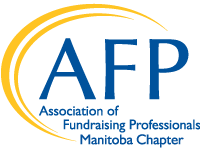 In Manitoba, professional fundraisers are represented by the Association of Fundraising Professionals (AFP) – the largest fundraising professional organization in the world! But the AFP is more than a professional association. In Manitoba, AFP represents a community of fundraising professionals – and acts as a partner with people and organizations who want to create positive impact through philanthropy. As an organization, we don’t change the world around us. We help professional fundraisers in this province create impact and affect change in their worlds and in their communities.